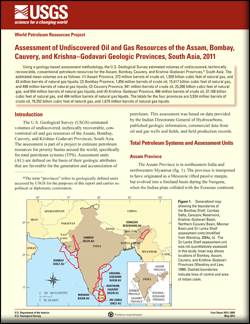 Using a geology-based assessment methodology, the U.S. Geological Survey estimated volumes of undiscovered, technically recoverable, conventional petroleum resources for the Assam, Bombay, Cauvery, and Krishna–Godavari Provinces, South Asia. The estimated mean volumes are as follows: (1) Assam Province, 273 million barrels of crude oil, 1,559 billion cubic feet of natural gas, and 43 million barrels of natural gas liquids; (2) Bombay Province, 1,854 million barrels of crude oil, 15,417 billion cubic feet of natural gas, and 498 million barrels of natural gas liquids; (3) Cauvery Province, 941 million barrels of crude oil, 25,208 billion cubic feet of natural gas, and 654 million barrels of natural gas liquids; and (4) Krishna–Godavari Province, 466 million barrels of crude oil, 37,168 billion cubic feet of natural gas, and 484 million barrels of natural gas liquids. The totals for the four provinces are 3,534 million barrels of crude oil, 79,352 billion cubic feet of natural gas, and 1,679 million barrels of natural gas liquids. Klett, T.R., Schenk, C.J., Wandrey, C.J., Charpentier, R.R., Cook, T.A., Brownfield, M.E., Pitman, J.K., and Pollastro, R.M, 2012, Assessment of undiscovered oil and gas resources of the Assam, Bombay, Cauvery, and Krishna–Godavari Provinces, South Asia, 2011: U.S. Geological Survey Fact Sheet 2012–3059, 4 p.